If you’ve been to Creative Experience in the last month, you may have met Ana Gomez. Hailing from the Ex’treme Instituteopens a new window, Ana has been working with us as an intern extraordinaire, sharing her beatmaking chops, working one-on-one with patrons, developing trainings for staff, and scoring a short video about Creative Experience. 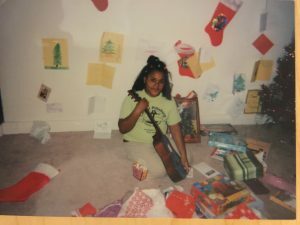 Ana got her first guitar when she was six, and music has always been a part of her life. It runs in her family, she says. (Fun fact: her great-uncle was the Cop in the Village People.) Ana is currently finishing her last year of her associate in Recording and Engineering with Management at the Ex’treme Institute and plans to record an EP of a friend’s band as her final project. 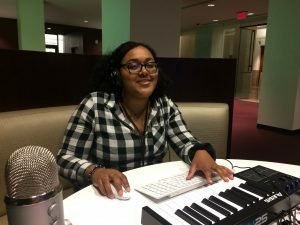 Ana will be with us in Creative Experience through the first week of October and is available from 11-4 MWF to assist patrons with FL Studio, Pro Tools, or other audio software. If you’re new to audio production, this is a great opportunity for one-on-one support. Stop in or email cexp@slpl.org to set up an appointment. Please also join Ana for a hands-on, small-group FL Studio Beatmaking workshop opens a new window offered on Fridays 9/22, 9/29, and 10/6 from 10-11 am. No experience is necessary.